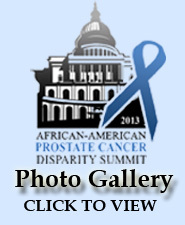 The Ninth Annual Summit featured informative sessions addressing the African American Prostate Cancer Disparity. Expert speakers and presenters, members of congress, survivors and community leaders came together to make this an exciting summit. Thomas W. Jarrett, MD - "A History of the PSA Test - Why the Controversy?" Thomas Farrington - "Presenting the PHEN Consensus Statement"
Sara Horton, MD - "The Importance of African American Participation in Clinical Trials"
Robert C. Tyler, PhD - "The Provenge Enrollment Experience"
Sean P. Collins, MD, PhD - "What is Sterotactic Body Radiation Therapy and its Advantages?" "A Novel Approach to Funding Research Efforts"
Reverend Natalie Mitchem, M. Div., R.D. Reverend Kip B. Banks, Sr.
H. Ballentine Carter, MD - "The Evidence Suporting Active Surveillance"
Edward M. Schaeffer, MD, PhD - "Active Surveillance and African Americans; A Study's Findings"
"Genomic Tests to Help Determine if the Cancer is Life-Threatening"
Jennifer Harris, Pharm D - "An Update on the ProstVac Immunotherapy Clinical Trial"